Celebrate the “can do” spirit of the American home front at Rosie the Riveter/World War II Home Front National Historical Park. The park includes many significant historic sites located throughout the city of Richmond, California, just across the bay from San Francisco. You'll find several options for exploring the rich history of this area. 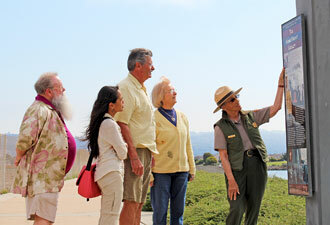 Take a hike or ride a bike along the San Francisco Bay Trail, join a ranger for an in-depth tour of the park, explore the Richmond shoreline by boat/kayak, or discover the incredible stories of the World War II home front workers through exhibits at the visitor education center. The best way to start your journey is at the recently opened visitor education center. Two award winning orientation films introduce multiple stories of 1940s America and the massive mobilization effort to support the military during World War II. 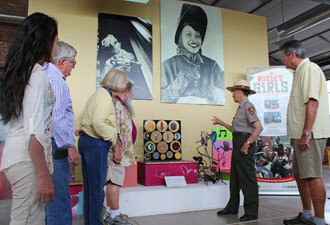 The park has an on-going museum project to collect and preserve the artifacts and stories of the Rosies, the women who worked in non-traditional jobs to support the military effort, and other civilians who worked or volunteered in America during World War II. Meet several of these inspiring Rosies on almost any Friday at the visitor education center where they share their stories and experiences. Attend an unforgettable program with ranger Betty Soskin who relates her WWII-era experiences as a young African American woman working in a segregated union office during the war. Ranger Soskin's program starts at 2 pm on most Tuesdays and Saturdays. On Thursdays at 2 pm, the park hosts a film about the experiences of Richmond's Japanese American families who were forced into internment camps during the war. Just a one-mile walk from the visitor education center, or a short drive, is the Rosie the Riveter Memorial. The memorial was created by a group of local people dedicated to preserving the history of the Kaiser Shipyards. Their efforts to create this massive public art project helped lead to the establishment Rosie the Riveter/World War II Home Front National Historical Park, dedicated on October 14, 2000, the same day that the Rosie the Riveter Memorial was finished. Visit historic Shipyard #3, the only remaining shipyard of the four built during the war. This yard, now the working Port of Richmond, is the only place to see Kaiser Shipyard structures from the World War II era. 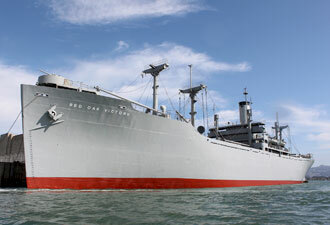 Many people drive to the end of the road to climb aboard the Red Oak Victory Ship, but you'll also find a parking lot at the entrance to the shipyard, and an overlook trail that winds up the hill for spectacular views of the bay. Volunteer docents at the Red Oak Victory ship will take any adventurous visitors on a tour on Tuesdays, Thursdays, Saturdays, and Sundays from 10 am to 3 pm. Scramble up and down the steep ladders inside the last remaining of the 747 ships built in the Kaiser Richmond Shipyards during the war. On the bridge of the ship, the docent might blow the loud air horn and or show how the merchant marines communicated with the engine room on the brass telegraph. The Maritime Child Development Center, owned by the park's friends group, the Rosie the Riveter Trust, has been fully restored and is once again a school for neighborhood children. One of the classrooms, made available to the National Park Service, has been filled with the actual furniture used by children in the 1940s and displays exhibits about the important role these child care centers played in supporting working mothers during the war. Other World War II park sites are still under development, such as the historic Kaiser Hospital, Richmond's Fire Station #6, and the Atchison Village Mutual Homes Corporation. These buildings can be seen from the outside, on a self-guided auto tour or on a monthly ranger-guided bus tour (be sure to reserve a seat ahead of time). There are so many ways to enjoy and explore this national historical park. Please call (510) 232-5050, ext. 0; seven days a week from 10 am to 5 pm if you have any questions not answered on our website. We look forward to seeing you in the park!